Sorry for not updating in a while, Work is a killer, so I can only really work on the LP on the weekends. 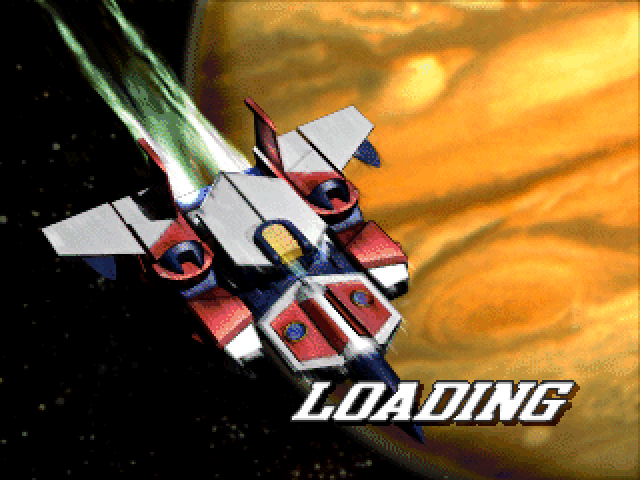 Also, If you want to talk about your favorite Series/Pilots/Robots featured in the game, please feel free to do so. Just please keep spoilers to a bare minimum for both the game, AND the shows. 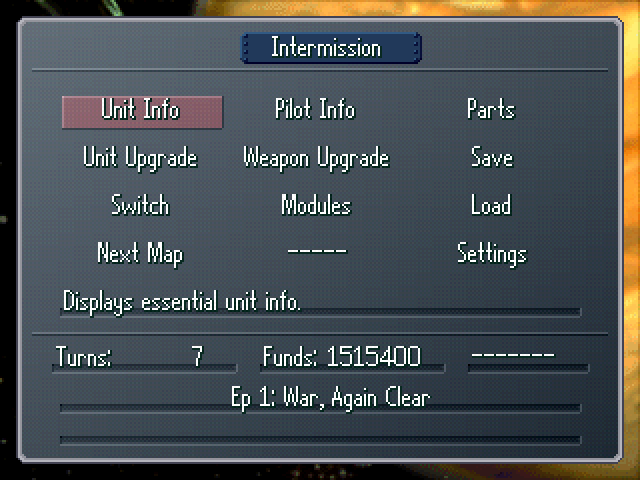 This is the Intermission Menu, This screen allows up to mess around with our Giant Death Machines in between missions. Parts, Switch, and Modules aren't really important right now, so I'll explain them later. 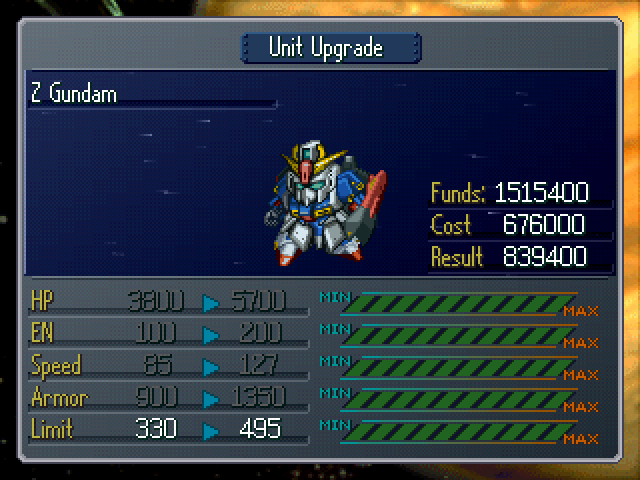 Today, I'm going to explain the Upgrade feature, which allows you to improve you mechs performance with the funds you acquire throughout the game. This is very important, since if you don't upgrade your mechs, you will get your teeth kicked in. The stats here should be pretty clear on what they do, but Limit isn't so clear. Your mechs have a certain evasion limit. 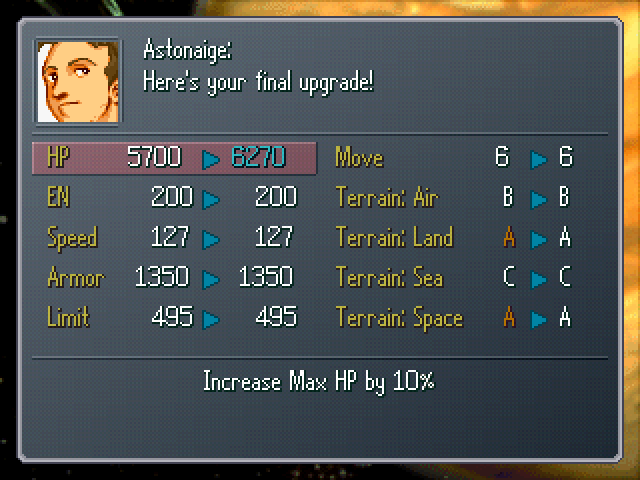 The way evasion works is that it adds up both you mechs speed, and your pilots Evade stats. However, there is a limit to how good your mech can be at evading, so there is a Limit in place that you have to upgrade in order to let your mech be harder to hit. 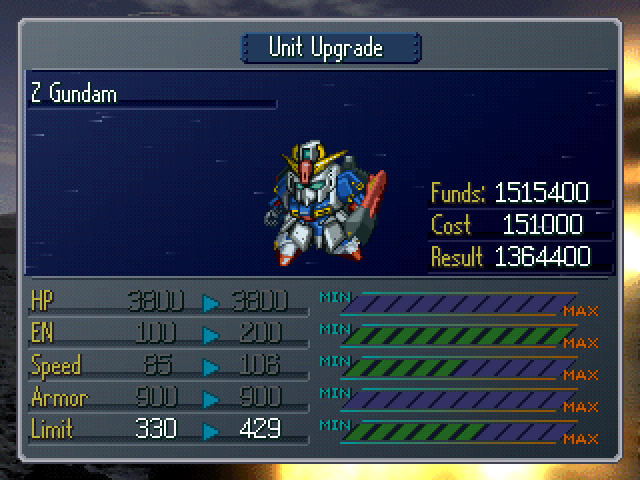 Thanks to the extra funds I have from using a New Game+ save file, I can completely upgrade the Zeta Gundam. But that would be a horrible waste of money. The general rule of thumb concerning upgrading units is that for Real Robot units (stuff like Gundam and Macross) your top priority is to upgrade EN, Speed, and Limit. Real robots are better for taking out grunt units and to drain an enemy of it's EN by dodging it's attacks. Super Robots (Like Mazinger and Getter) should concentrate on their EN, HP, and Armor. Super Robots are your heavy hitters. Meant to take damage and to dish it right back. Make all unit/weapon ranks A on Air, Land, Sea, or Space. 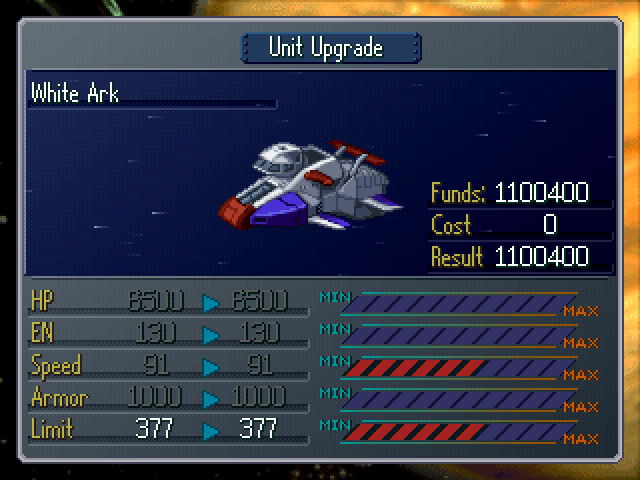 I don't plan on ever completely upgrading a unit, so this menu will have very little use for me. 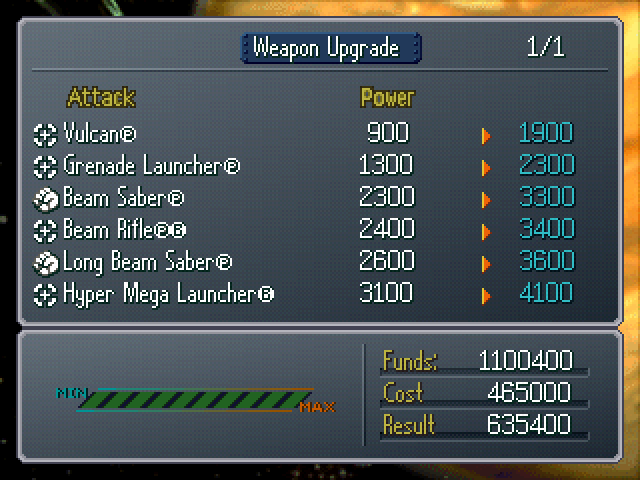 You can also upgrade a unit's weapons. It's pretty goddamn expensive too. I won't be upgrading weapons for a while, since their base damage right now is good enough. Next time, I actually start the next mission!